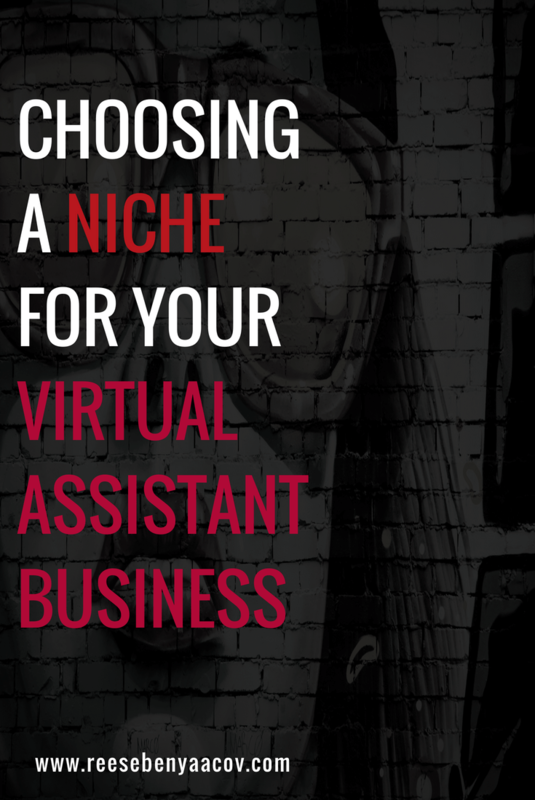 I've talked before about how the best way to grow your business is by choosing a niche. And yet many VAs still worry that by choosing to focus on just one target market, they'll be closing the door on lots of potential clients. Although it may seem counter-intuitive, it's a fact these days that if you're trying to target everyone, you actually end up getting far fewer clients than you would if you had actually gone after a much smaller group. Picking a niche is also a great way to grow a business that's stagnated or that you just don't know what to do with. After you've reached a certain level of experience, it's more than OK to choose an area to focus on. So what if you want to pick a niche but you have absolutely no idea where to start? First of all, the absolute worst thing you could do would be to pick something at random. Like, maybe you heard that life coaches are all the rage and you think that that would be an easy market to target. So you rebrand your site to focus on life coaches and start promoting it around the clock on social media. A few days pass... and then a few weeks. But instead of getting an influx of new clients, you get nothing more than a temporary uptick in page views. No one is buying what you're offering and you're left feeling frustrated and wondering where you went wrong. Take a look through the laundry list of services that you currently offer (and believe me, I know that you're experienced in offering a LOT of different services!). Mark down the ones that are your absolute favourites, as well as the few that you'd be perfectly happy never doing again. It's also a good idea to make note of which items your clients are asking for over and over again and which ones are almost never asked for. Write down every type of client that you've ever worked for or that you've ever wanted to work for who are in dire need of what you like to do. Don't be afraid of making your list too big. This is your brainstorming session so make sure to get it all out, even if an idea initially sounds dumb. Using the information that you generated in the previous two steps, you can now pick a niche to explore further. Now, you can do this one of two ways. You can either pick a certain type of client that you like working with or you can pick a kind of tool or service that you're really excited about. For example, maybe you've worked with a lot of dentists. So you already know all the dental jargon and you have a really good idea of just what dentists need from a VA. This would be an example of you targeting a certain type of client. On the other hand, maybe you're an absolute superstar at using Mailchimp or Aweber and you decide to just offer services dealing with email marketing. A lot of different types of businesses in many different areas will need help with those services, so this would be an example of niching it down based on service and NOT based on a client. If you pick a niche and there's only one person in that field willing to pay you... then you have a major problem. Before you go about changing all of your web copy and loading up hyper-targeted promos into Hootsuite, make sure that there's actually a decent sized market out there that wants what you're going to offer. If so, great! Now you can build your business around your idea. And if not, it's better to find out up front before you waste a lot of time and energy trying to go after people who are never going to be interested in your idea. Since you've already been researching the profitability of your niche, you should already be fairly familiar with the pain points and language that your chosen niche uses when describing their problems. Take the real words that your target market is saying and use them in your website copy. When your market sees that you perfectly understand what their pain points are and know how to solve them, they're going to be beating down the doors to work with you. But what if all the above isn't giving you that creative spark that you were hoping for and you still can't pick a niche?. Natalie Lussier came up with an idea to tailor your niche to your personal story. That's it! Now that you've got a niche, you can move on and continue to grow your business. What did you think of this exercise? Still, have a few more questions about niching yourself? Let me know in the comments!